My friend Mary, who knows I like to can, sent me a link to a yummy looking tomato sauce recipe the other day. 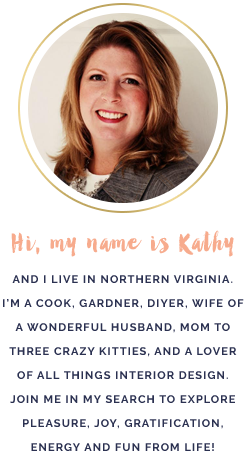 It's funny, because I was just looking at that recipe or a similar one a few days earlier and it got me thinking about how my canning preferences have changed over the years. 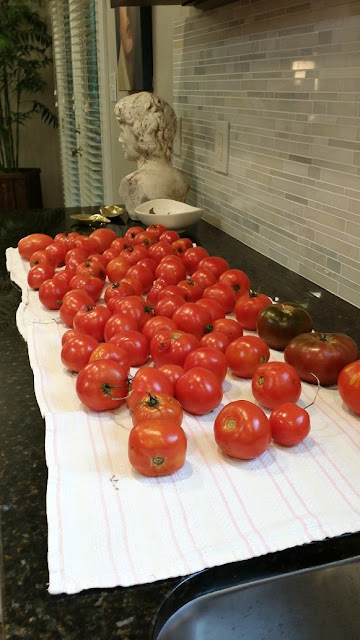 In the past, I would have jumped at any yummy sounding tomato sauce recipe and still even make my Chunky Basil Pasta Sauce and Annie's Salsa pretty regularly, but more and more I am finding that I'd rather have and use more plain, crushed tomatoes throughout the year. I think I am finding that I like having the clean slate that crushed tomatoes can provide. Don't get me wrong, I love the convenience of having a ready-made seasoned sauce on hand as well, but some recipes, like Mexican dishes, don't always call for that. So, for the most part, I've been focusing on plain, roasted tomatoes that I can add to chili, sauces, casseroles, soups, and even pot roasts. I always can in quarts, as I feel that I rarely use just a pint of roasted tomatoes, plus I feel it's more efficient. Preheat oven broiler to high and place oven rack 6 inches away from heat. Rinse tomatoes, slice in half and remove hard cores. 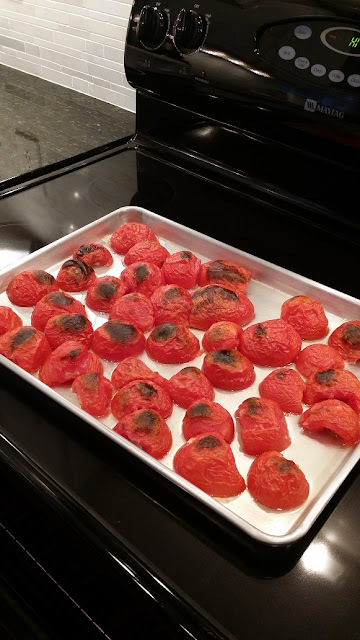 Place tomatoes on a cookie sheet skin-side up. Roast tomatoes till the skins are charred, about 15 minutes. Remove from oven and cover with a dish towel to let the tomatoes steam and cool. When cool enough to handle, pull skin off and discard. Place all the roasted tomatoes in a large pot and bring to a simmer. Prepare canning jars and lids. 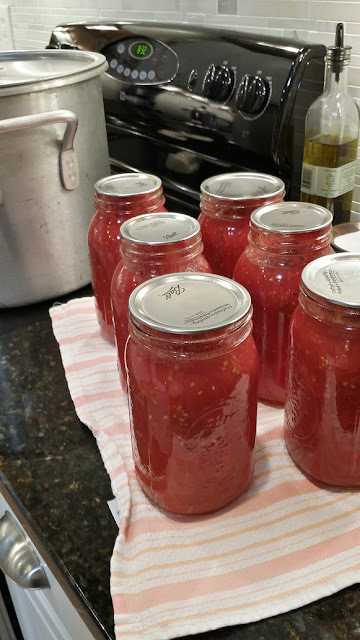 When jars and lids are ready, ladle tomatoes and 2 tablespoons of lemon juice into each jar. I usually fill halfway, add a tablespoon, then fill the remaining amount and add the second tablespoon. This way, the lemon juice is well distributed in the jar. Process quarts in a BWB for 45 minutes. When finished, remove canning pot to a cool burner and leave the quarts in the water for 5-7 minutes more before removing (to prevent siphoning).